Adani Realty launching Samsara villa Floors for those who akin exclusive lifestyle in a privacy of an independent floors, a private basement and an exclusive terrace area. 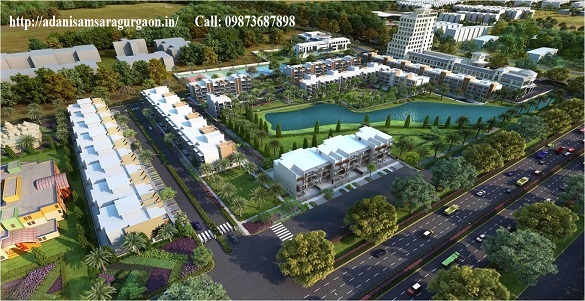 Adani Samsara has 3 & 4 BHK Villa Floors with lifts, dedicated car park with low density, only 222 units in 18 Acres. Adani samsara floors in sector 60 Gurgaon has its unique features which gives you best of your living standard along with the best location of Gurgaon. Surrounded by luxurious apartment of Ireo, M3m, Conscient etc. these Floors will give you the feel of independent house with the sense and facilities of high rise. Samsara Floors is a gated community with 3 tier security. You can enjoy a cost effective villa floors with your private basement and terrace. The hassle free living in low maintained area with best of social amenities like Club, Pool, Spa, Gym, Outdoor & Indoor activity will give you sense of high rise apartments. Adani realty is a well-known name in the real estate industry who has developed 69 million sqft area which include residential, commercial and social club projects. Adani realty has foot prints in Ahmedabad, Mumbai, Gurgaon, Kochi & Mundra. Adani realty also won best residential project in the luxury category for water lily in Ahmedabad. Adani Realty Presents Samsara - In Gurgaon a modern Residential development in the heart of Gurgaon. Adani Samsara Floors, is the latest new residential project from Adani Realty in Gurgaon. Adani Realty with New York based Brahma Management, is jointly building a township of over 145+ acres in NCR,Gurgaon. The development potential of the township project totals 5 million square feet. After the Sucess of Adani Aangan which is located in Sector 88A-89A Gurgaon Adani Realty presents Samsara, new residential project in Gurgaon. Adani Samsara Gurgaon, a modern & much awaited state of art residential development in the heart of Gurgaon is here to enthral investors. A fully integrated gated community equipped with all the modern amenities located in Gurgaon is the most widely spoken about new residential project in Gurgaon. Adani Samsara is going to be an iconic development. After delivering their expertise in Ahmedabad and Mumbai, Adani realty is now expanding itself in Gurgaon. Though they have huge land of commercial and residential in Gurgaon Adani has also delivered Affordable Housing project in Gurgaon. Their first project Adani Aangan is located in sector 88-89 Gurgaon which has received lots of positive response from the customer.! 2/3 BHK Premium Residential Project. Located in Heart of Gurgaon. It is a Part of 145 Acre Township. Tentative Size Range 1000 Sq.ft. - 2000 Sq.ft . Scaling Greater Heights with Every Project. Let life kickoff next to a football field . Adani realty Gurgaon is now coming up with residential plotting in sector 60 by the name of Adani Samsara which is located in the heart of Gurgaon and the surrounding already developed by other luxury builders like Ireo, M3M, Conscient, Emaar etc. Adani realty is building Adani Samsara sector 60 Gurgaon jointly with New York based Brahma Management which will be spread across 145 acres. Adani Samsara floors will consist of fully integrated 2-3 BHK with tentative range of 1000 sqft – 2000 sqft. Adani samsara floors will be low rise development i.e. G+2 with stilt parking and the investment will start from 1.6 Cr approx. Adani Realty, the youngest arm of the Adani Group, is developing close to 69 million sq. ft. of real estate space including residential, commercial and social club projects across Mumbai, Gurgaon & Mundra. This projects have won awards for Best Residential Project in the Luxury category (Water Lily) and in the Affordable Housing category (Aangan) at the CNBC Awaaz Real Estate Awards, 2015, for Ahmedabad city. Growing from strength to strength, Western Heights won the Premium Project of the Year award at the Accommodation Times 2nd International Real Estate Annual Awards, 2015. And to top it off, The Belvedere Golf and Country Club was named the Best New 9 Hole Golf Course at the India Golf Expo, 2016. With so many accolades under our belt, our commitment to craft award winning projects is stronger than ever. Adani Samsara Gurgaon will be starting at a price of around 1.6* Cr onwards (approx.). It is a low rise development with a Stilt Parking on the ground floor and three residential floors above. Basement and Terrace will be for the use of the residents as decided by the developer. Major focus has been given on luxury and greenery in this project.